Roger Meddows Taylor (born 26 July 1949) is an English musician, singer, songwriter, and multi-instrumentalist, best known as the drummer for the rock band Queen. As a drummer, Taylor was recognised early in his career for his unique sound. He was voted by radio listeners as the eighth-greatest drummer in classic rock music history in a poll conducted by Planet Rock in 2005. As a songwriter, Taylor contributed songs to Queen's albums from the beginning, composing at least one track on every album, and often singing lead vocals on his own compositions. He wrote or co-wrote three UK number 1s ("These Are the Days of Our Lives", "Innuendo" and "Under Pressure") and contributed a further five major hits ("Radio Ga Ga", "A Kind of Magic", "Heaven for Everyone", "Breakthru", and "The Invisible Man"). He is also the main writer on the international top-ten hit "One Vision", although the track is credited to the whole band. He has collaborated with such artists as Eric Clapton, Roger Waters, Roger Daltrey, Robert Plant, Phil Collins, Genesis, Jimmy Nail, Elton John, Gary Numan, Shakin' Stevens, Foo Fighters, Al Stewart, Steve Vai, Yoshiki, Cyndi Almouzni, and Bon Jovi. As a producer, he has produced albums by Virginia Wolf, Jimmy Nail and Magnum. Not to be confused with Roger Taylor (Duran Duran drummer). As a songwriter, Taylor contributed songs to Queen's albums from the beginning, composing at least one track on every album, and often singing lead vocals on his own compositions. He wrote or co-wrote three UK number 1s ("These Are the Days of Our Lives", "Innuendo" and "Under Pressure") and contributed a further five major hits ("Radio Ga Ga", "A Kind of Magic", "Heaven for Everyone", "Breakthru", and "The Invisible Man"). He is also the main writer on the international top-ten hit "One Vision", although the track is credited to the whole band. He has collaborated with such artists as Eric Clapton, Roger Waters, Roger Daltrey, Robert Plant, Phil Collins, Genesis, Jimmy Nail, Elton John, Gary Numan, Shakin' Stevens, Foo Fighters, Al Stewart, Steve Vai, Yoshiki, Cyndi Almouzni, and Bon Jovi. As a producer, he has produced albums by Virginia Wolf, Jimmy Nail and Magnum. Roger Taylor was born on 26 July 1949 in the West Norfolk & Lynn Hospital, Exton's Road King's Lynn, Norfolk. The new maternity ward was opened by Princess Elizabeth (the future queen, Elizabeth II), where she was introduced to 16 new mothers including Winifred Taylor, his mother. Taylor first lived at 87 High Street in King's Lynn, and later moved to Beulah Street in the town. Taylor's first school was Rosebury Avenue school. Taylor moved to Truro, Cornwall, south west England, with his mother Winifred, father Michael and younger sister Clare. When he was seven years old, he and some friends formed his first band, The Bubblingover Boys, in which he played the ukulele. He briefly attended Truro Cathedral School; at the age of 13, he joined Truro School as a day boy. At the age of 15, Taylor became a member of The Reaction, a semi-professional rock band formed mainly of boys from Truro School. Taylor had originally learned guitar, but became a drummer when he realised he had a more natural aptitude for it. Taylor taught himself to tune his drums, inspired by Keith Moon of The Who because of the "great drums sounds" on the early Who records. Another key influence on Taylor was drummer Mitch Mitchell of The Jimi Hendrix Experience, who Taylor stated was his early role model. In 1967, Taylor went to London to study dentistry at the London Hospital Medical College, but he became bored with dentistry. He changed to biology and obtained a BSc at East London Polytechnic. Taylor met Brian May and Tim Staffell in 1968 after a friend saw an advert on a noticeboard at Imperial College for a drummer. Smile included May on lead guitar, Staffell on lead vocals and bass, and later Taylor on drums. The band lasted for two years before Staffell departed to join Humpy Bong, leaving the band with a catalogue of nine songs. 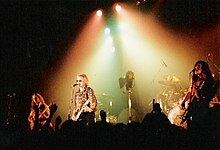 Smile reunited for several songs on 22 December 1992. Taylor's band the Cross were headliners and he brought May and Staffell on to play "Earth" and "If I Were a Carpenter". Taylor performing with Queen in 1979. In 1969, Taylor was working with Freddie Mercury at the Kensington Market (they were sharing a flat at around the same time). Mercury, then known as Freddie Bulsara, was an avid fan of Smile. The band split up in 1970. In the same year, Taylor turned down the chance to become drummer for Genesis, which led to Phil Collins joining instead. Bulsara convinced the remaining two members of Smile to continue and he eventually joined the band, which he renamed Queen. In 1971, they found bass guitarist John Deacon and brought him into the band, before going on to release their self-titled debut album in 1973. Taylor is the third most credited songwriter for the band, usually contributing one or two tracks per album, and he is considered a prominent songwriter. Taylor has had a productive solo career, releasing five albums. His first single was his 1977 "I Wanna Testify". He recorded it during Queen's sessions for the News of the World album. The A-side, although a cover of the Parliaments song of the same name, was completely different from the original. The B-side was a self-penned song "Turn on the TV". Taylor's first solo album, Fun in Space, was released in 1981. Taylor performed all vocals and played all instruments aside of about half of the keyboards, which were done by engineer David Richards. With Queen still touring heavily and recording at the time of release, Taylor was unable to promote the album to its fullest extent, so he appeared on some European TV shows to promote the single, "Future Management", including Top of the Pops. The only other single to come from the album was "My Country". The only US single released from the album was "Let's Get Crazy". Taylor's next venture, Strange Frontier, came in June 1984. The three singles from the album were the title track, "Beautiful Dreams" (in Portugal only) and "Man on Fire", the latter becoming a live favourite for him in later years. No attempts to promote the singles were made since Queen toured to promote The Works, and Taylor did not perform on any TV shows. Strange Frontier included guest appearances by bandmates Freddie Mercury, Brian May and John Deacon. Mercury sang backing vocals on "Killing Time", Deacon remixed the B-side "I Cry For You" and Rick Parfitt co-wrote and played on "It's An Illusion". David Richards, Queen's engineer and producer at the time, also co-wrote two of the tracks. The album includes covers of Bruce Springsteen's "Racing in the Street" and Bob Dylan's "Masters of War". In 1986, Taylor co-produced Vigilante, the sixth studio album by rock band Magnum. After Queen finished their 1986 Magic Tour, Taylor started a new band, The Cross, which released three albums over their six years of existence. In 1993, the band split up, after performing one final gig at the Gosport Festival. In 1994, Taylor worked with Yoshiki, drummer and pianist of X Japan and released the song "Foreign Sand" and a reworking of the Cross's "Final Destination". The album Happiness? was "Dedicated to the tasmanian tiger – thylacinus cynocephalus, but most especially... for Freddie". "Nazis 1994" from this album became Taylor's first hit single in England and was followed by two other top 40 UK hits, "Happiness" and "Foreign Sand". In 1998, Taylor released his fourth solo album Electric Fire. He supported it with a small tour in the spring of 1999, on which Brian May joined him at the gig in Wolverhampton. Taylor also performed one of the first Internet-gigs – for which he got a mention in the Guinness Book of World Records. In 2010, after nearly twelve years between solo albums, Taylor planned to release a new studio album titled The Unblinking Eye. The first single, of the same name, was released on 23 November 2009 as a digital download, but due to popular demand it was released as a limited edition single. Originally leaked to the official Queen fan club's website for members only, it still managed to be on YouTube within hours of the early bird release. It was announced in late 2012 that fans would be able to vote on which songs appeared on the new album, with the album itself slated for release that year. The album is called Fun on Earth, and was released on 11 November 2013. The Cross were a side project of Taylor's that existed from 1987 to 1993 and released three albums. While still the drummer for Queen, Taylor fronted the Cross as rhythm guitarist and lead vocalist. On its debut release, The Cross incorporated dance influences which they dropped on their remaining two albums. The band never enjoyed much commercial success, except in Germany. After Queen's 1986 Magic Tour, the band members went their separate ways to do various solo work. Taylor decided to form a new band with whom he could tour. He had already written and recorded the album himself before finding a band to play the songs with. He eventually placed an ad for band members in a national newspaper, hinting he was a famous rock musician. 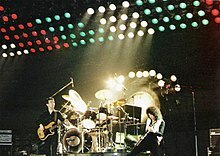 The position of keyboard player was duly offered to Spike Edney after two successful Queen tours in which Edney had played. When the auditions were over, the line-up was completed by Peter Noone on bass, Clayton Moss on guitar and Josh Macrae on drums. Taylor himself would take the responsibility on lead vocals and rhythm guitar. The first album, Shove It, was released in 1988. In Europe, 'Heaven for Everyone" (later a Queen song) contained Freddie Mercury on lead vocals and Taylor on backing vocals. However, on the single version and American album version the roles were switched. The European CD contained an extra track (compared to cassette and LP) in the 2nd Shelf Mix, the US version having "Feel The Force" as its extra track. The band promoted hard (especially in Germany), with many TV performances of singles including an appearance at the Montreux Golden Rose festival in 1988. The tour took in dates in the UK and Germany. Three singles were released from the album: "Cowboys and Indians", "Heaven for Everyone" and "Shove It". Another single, "Manipulator", was released in 1988, but it was not included on any album. It was also the only song from the time that had joint writing credits, Taylor sharing them with Edney and Steve Strange. After finishing Queen's 1989 album The Miracle, Taylor went into the studio with the rest of the Cross for the first time to record Mad, Bad and Dangerous to Know. The band composed the opening track "On Top of the World Ma" with a riff bearing a resemblance to the Led Zeppelin track "Whole Lotta Love". The rest of the album consisted mainly of individually written songs, except for "Power To Love" which was the result of the combined effort of Macrae, Noone and Moss. Clayton Moss sang lead vocals on his own track "Better Things", and Spike Edney played mandolin on "Final Destination", which was written by Taylor. "Final Destination" was released as a single, as were "Liar" and "Power To Love", the latter being the last single to be released in the UK by the band. "Final Destination" came with a live rendition of Taylor's song "Man on Fire" as a B-side, and "Liar" (Noone) had a brand new track, "In Charge of My Heart", which was also penned by Taylor. The 12" single and CD of "Liar" also included extended remixes of both "Liar" and "In Charge of My Heart". The instrumental section at the beginning of "In Charge of My Heart" was used as the opening to concerts on the accompanying tour. "Closer To You" (Edney) had been planned to be released in America, but never was. The group having seemingly given up on the UK market, the accompanying tour only included dates in Germany, Austria, Switzerland and Ibiza. Unusual for such tours, every song from the new album was played live. Made at a time when Taylor's efforts were concentrated on Queen and Mercury himself, Blue Rock gave the other members of the band a chance to take control of the upcoming album. It was in fact mostly written by Edney, who contributed three of his own tracks and contributed to four more. Once again the opening track was penned by the entire band, "Bad Attitude" was written (although not complete) by the Christmas fan club party of 1990. The album itself contained a lot of vocals not from Taylor, but mainly of Edney and Noone. Examples of this can be heard in "Put It All Down To Love" (Edney), "Life Changes" (Moss, Noone, Edney and Macrae) and "Heartland" (The B-side to Life Changes, penned by Noone). Blue Rock itself was only released in Germany (although promo copies were released in Italy and Japan), so copies are somewhat rare. "New Dark Ages" (Taylor) was released in Germany with another live version of "Man on Fire", whilst "Life Changes" was released with the B-side "Heartland". It was however immediately withdrawn due to Mercury's death. The tour was in support of Magnum, so the concert lengths were short (45 mins.) and very few bootlegs have survived. The tour pace was rapid, covering 20 dates in one month. The band broke up in 1993 after performing a final show. Taylor continued working with Queen and produced solo albums. Drummer Macrae accompanied Taylor on his solo tours and also played percussion at the Freddie Mercury Tribute Concert. Both Taylor and keyboardist Edney participated in the Queen + Paul Rodgers tours, while Macrae worked behind the scenes as co-producer, sound engineer and Pro Tools engineer for them. In the late 1990s, Edney formed the SAS Band ("Spike's All Stars"), a group with an ever-changing line-up of popular '80s musicians. Taylor has appeared along with May for various other events and promotions, including Queen's induction into the Rock and Roll Hall of Fame in 2001 and the "Party at the Palace" in 2002, celebrating the golden jubilee of Queen Elizabeth II. In 2004, Taylor, May, and Mike Dixon received the Helpmann Award for Best Music Direction for the musical We Will Rock You. At Live Earth in 2007, Taylor opened the concert with Taylor Hawkins of Foo Fighters and Chad Smith of Red Hot Chili Peppers. Taylor and May, performing as Queen, also appeared three times on the American singing contest television show American Idol. The first appearance was on 11 April 2006, during which that week's contestants were required to sing a Queen song. Songs performed included "Bohemian Rhapsody", "Fat Bottomed Girls", "The Show Must Go On", "Who Wants to Live Forever", and "Innuendo". The second time Queen appeared was on the show's season 8 finale in May 2009, performing "We Are the Champions" with finalists Adam Lambert and Kris Allen. The third appearance was during the eleventh season on 25 and 26 April 2012, performing a Queen medley with the six finalists on the first show. The following day, they performed "Somebody to Love" with the Queen Extravaganza band. In November 2009, Taylor appeared on the reality TV show The X Factor with May as Queen mentoring the contestants, performing "Bohemian Rhapsody". Also in that month, Taylor confirmed he was planning to tour with Taylor Hawkins, which Taylor described as a "quick tour". At the 2011 MTV Europe Music Awards on 6 November, Queen received the Global Icon Award, and Taylor and May closed the awards ceremony, with Adam Lambert on vocals, performing "The Show Must Go On", "We Will Rock You", and "We Are the Champions". In 2011, Taylor, along with Steven Tyler and Roger Daltrey, joined the advisory board of Edge Music Network. Taylor performed in the 2012 Summer Olympics closing ceremony in London on 12 August. In 2013 and 2014, Taylor served as an executive producer of the film Solitary, directed by Sasha Krane. In addition to those duties, he provided original music, including the song "When We Were Young" and three instrumental songs which serve as incidental/background music in the film and during the closing credits. Taylor also appeared as special guest for Welsh Rock artist Jayce Lewis and his project Protafield, with Taylor providing drums on the track "Wrath". On 15 November 2014, Taylor joined the charity group Band Aid 30, playing drums alongside current British and Irish pop acts on the latest version of the track "Do They Know It's Christmas?" at Sarm West Studios in Notting Hill, London, to raise money for the 2014 Ebola crisis in Western Africa. On 5 and 6 September 2015, Taylor, along with Led Zeppelin's John Paul Jones, joined Foo Fighters on stage in Milton Keynes to perform a cover of the Queen and David Bowie song "Under Pressure". Taylor has stated that his early role model as a drummer was Mitch Mitchell of The Jimi Hendrix Experience. He said: "I still think listening to Mitch Mitchell, especially the early stuff with Hendrix, is just fantastic. This fusion of jazz technique and wonderful riffs but with this rolling ferocious attack on the whole kit, it had lots of jazz influences I think. In fact for me he played the kit like a song, it was just wonderful. Total integration into the song. Not just marking time". Taylor has also expressed great admiration for John Bonham of Led Zeppelin. Speaking of Bonham, Taylor said, "The greatest rock and roll drummer of all time was John Bonham, who did things that nobody had ever even thought possible before with the drum kit. And also the greatest sound out of his drums – they sounded enormous, and just one bass drum. So fast on it that he did more with one bass drum than most people could do with three, if they could manage them. And he had technique to burn and fantastic power and tremendous feel for rock and roll". However, for just sheer technique, Taylor described the jazz and big band drummer Buddy Rich as "the best I've ever seen". Speaking to Modern Drummer in 1984, Taylor also described Keith Moon, the drummer of The Who, as "absolutely brilliant...he had a total unique style; he didn't owe anyone anything." A species of the genus Heteragrion (Odonata : Zygoptera) from Brazil was named Heteragrion rogertaylori in honour of Taylor in 2013, with the etymology: "I name this species after Roger Taylor, drummer and songwriter, whose powerful sound, wonderful lyrics and raspy voice have enchanted the world for over four decades." In 1999, Taylor became the first living person, other than members of the British Royal Family, to appear on a Royal Mail stamp, being seen behind Freddie Mercury as part of a "Great Britons" issue. This caused controversy as it was an understood rule that the only living people allowed to appear on British stamps could be members of the Royal Family. In 2002, Taylor appeared on the "Twelve Drummers Drumming" Christmas card in the "Twelve Days of Christmas" set sold at Woolworths to raise money for the National Society for the Prevention of Cruelty to Children – alongside Duran Duran's drummer of the same name. ↑ Macnab, Geoffrey. "Roger Taylor interview: The Queen drummer has written the soundtrack for British film Solitary". Independent. Retrieved 6 October 2016. ↑ "Zeppelin voted 'ideal supergroup'". BBC News. 10 July 2005. Retrieved 28 January 2008. ↑ "These Are the Days of Our Lives". Bechstein Debauchery. Archived from the original on 17 December 2007. Retrieved 28 January 2008. ↑ "The Invisible Man". Bechstein Debauchery. Archived from the original on 17 December 2007. Retrieved 28 January 2008. ↑ Trevor, Heaton. "Rock Star's Norfolk Childhood". Queen Archives. Eastern Daily Press. ↑ "Roger". themarchoftheblackqueen.piczo.com. Retrieved 8 April 2012. 1 2 "Roger Taylor Interview". Queen Zone. Archived from the original on 15 July 2015. Retrieved 10 August 2015. 1 2 3 4 "Roger's Drum Master Class (Music Works - BBC World Service, November 28, 1993)". Queen Online. Retrieved 10 August 2015. ↑ "Roger Taylor". Queen official website. Retrieved 15 January 2017. ↑ Rose, Frank. "Heavy Meddows Kid". Queen Archives. Eastern Daily Press. ↑ "Queen 40th anniversary: 10 things you never knew". The Daily Telegraph. 24 September 2011. Retrieved 27 August 2015. ↑ Patrick Lemieux; Adam Unger (2013). The Queen Chronology: The Recording & Release History of the Band. Across the Board Books. p. 54. ISBN 978-0991984046. ↑ "Roger Taylor". Biography. Retrieved 2018-03-01. ↑ Gregory, Andy (2002). The International Who's Who in Popular Music 2002. Psychology Press. ISBN 9781857431612. ↑ "QueenOnline – News". 17 November 2009. Retrieved 1 December 2009. ↑ "Roger Taylor To Release Solo Album | Rock News | News". Planet Rock. 22 November 2012. Retrieved 27 June 2013. ↑ "Queen's Roger Taylor Talks Solo Work, Hopes Band Will Record With Adam Lambert". Billboard. Retrieved 2018-03-01. ↑ "The Cross (3) - Shove It". Discogs. Retrieved 2018-03-01. ↑ "Shove It - Cross | Songs, Reviews, Credits | AllMusic". AllMusic. Retrieved 2018-03-01. ↑ "Queen: inducted in 2001 | The Rock and Roll Hall of Fame and Museum". Rockhall.com. 15 April 2013. Retrieved 16 July 2014. ↑ "Party at the Palace". QueenVault.com. 3 June 2002. Retrieved 16 July 2014. ↑ "Past nominees and winners Helpmann Awards". Retrieved 16 December 2016. ↑ "'Somebody to Love' on 'American Idol' – Video". Rolling Stone. 27 April 2012. Retrieved 16 July 2014. ↑ "Queen And Foo Fighters Drummers To Team Up For 2010 Tour". Gigwise. 17 November 2009. Retrieved 16 July 2014. ↑ Penny Newton (6 November 2011). "Katy And Adam Honour Queen! | Queen | News | MTV Australia". Mtv.com.au. Retrieved 16 July 2014. ↑ "Roger Taylor of Queen guest appearances discography". Rogertaylor.info. Archived from the original on 9 August 2014. Retrieved 29 September 2014. ↑ "He will, he will, rock you! Jayce Lewis is granted an audience with Queen star – Wales Online". walesonline. Retrieved 29 September 2014. ↑ "Queen drummer Roger Taylor agrees to play on Welsh rocker Jayce Lewis' new album". walesonline. Retrieved 29 September 2014. ↑ "Band Aid 30: One Direction among celebrity line-up". Telegraph. 11 November 2014. Retrieved 11 February 2015. ↑ Lencioni, F.A.A. (9 July 2013). "Diagnoses and discussion of the group 1 and 2 Brazilian species of Heteragrion, with descriptions of four new species (Odonata: Megapodagrionidae). Zootaxa 3685 (1): 001–080" (PDF). Zootaxa. Magnolia Press - Auckland, New Zealand. Retrieved 26 September 2015. ↑ Rohrer, Finlo (14 October 2008). "The politics of stamps". BBC News. Retrieved 29 October 2011. ↑ Alex Spence. "Royal Mail unveils Beatles album cover stamps (''Times'' Online)". The Times. UK. Retrieved 29 October 2011.